NOTHING says pooch pampering like a Land Rover branded bowl and a design-specific access ramp for a more elegant entry into one's SUV. Land Rover has released a range of 'Pet Packs' for those who want to spread the luxury to man's best friend. Among the accessories quilted load space liner to protect against paw prints, a foldable pet carrier, access ramp, spill-resistant water bowl and "a portable rinse system for those muddy walks". Nothing worse than having the Rangie sullied. Prices start from $91 for the spill-resistant water bowl, $743 for the portable rinse system or $650 for the pet access ramp. Or there is the tartan dog harness at $56, and a matching bandanna for an extra $30. The packs start from $945 for the Transportation Pack which incorporates a foldable pet carrier, bowl and rummer mat, and rise to $2894 for the Pet Care and Access Pack hat includes a full height luggage partition divider, quilted loadspace liner, access ramp and rise system (prices vary depending on model). "Land Rover is all about enjoying the great outdoors and that goes hand-in-hand with dog ownership for many customers," marketing director Finbar McFall said. "Our customers told us that the comfort of their dogs on car journeys is crucial. They are part of the family and we recognise that. 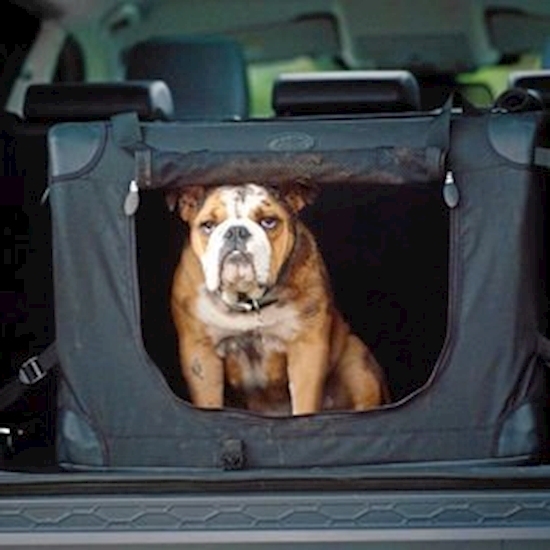 Our new Pet Packs aim to allow dogs to travel in real comfort and make journeys simpler and more relaxing for dogs and at the same time protect the inside of owners' vehicles." The Land Rover pet accessories are available for the Discovery Sport, Discovery, Range Rover Evoque, Range Rover Velar, Range Rover Sport and Range Rover. While the range was available in the UK two months ago, it has now arrived in Australia.